Interest rates don't rise meaningfully and sustainably without strong economic growth and inflation, and both are still absent. NEW YORK (TheStreet) -- It attests to the optimism/long bias of Wall Street, money managers and financial media that in these circles, 200,000 continues to be the de facto benchmark for "healthy jobs growth" even though the U.S. economy is supposed to be in a postrecession recovery and 200,000 new jobs represents below average monthly growth since 1940. So, what does Friday's 173,000 August jobs print mean? (It's the 541st highest level of jobs increases as a percentage of total employment of 908 observations since 1940.) The chattering classes have already hedged their bets by broadly noting that initial August jobs reports are typically revised upward -- not scientific, but certainly worthy mentioning. But regardless, the August jobs number was a significant disappointment, and no revision will meaningfully change the ominous domestic or global economic trajectory. The official unemployment rate "dropped" to 5.1% because of a decline in the official labor force and a slightly higher increase in the official employed figure, but the real figure, adjusted for a normal participation rate that accounts for retiring baby boomers, is 9.9%, and that does not account for higher-than-historical-average underemployed or the wage quality of jobs being added. Interest rates have never risen meaningfully and sustainably in the absence of above-normal gross domestic product growth and inflation -- conditions that do not currently exist. The obsessive focus on whether the Federal Reserve raises interest rates in September, December or later is irrelevant unless one is a daytrader. 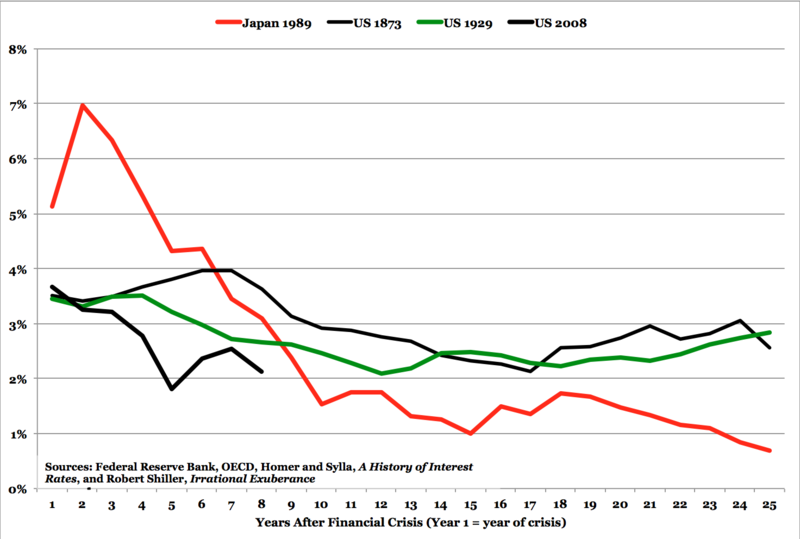 Moreover, financial crises historically have produced extended periods of economic sluggishness and long-term rates below 3% for more than 20 years (see chart below). The Fed is wringing its hands because the plan behind zero-bound interest rate policy and quantitative easing was to boost economic growth through stimulation of capital spending (hasn't happened) and a wealth effect from rising asset values (asset values have spiked, but no apparent wealth effect) to be followed by normalization of rates once growth and inflation reached targeted levels (hasn't happened). The failure of the desired economic outcomes to materialize has left the Fed uncertain as to the appropriate next move, fearing unintended consequences from unprecedented, protracted easy money (asset bubble formation and excessive risk taking broadly) while concurrently recognizing the negative economic feedback risk of raising rates/cost of capital in the face of below-normal GDP growth, excessive real unemployment, stagnant real wages and below normal inflation rates. The Fed's unprecedented experiment is perhaps best reflected in the protracted period of yield spreads in excess of 1.5%, into an eighth year vs. three years typically. The longest previous streak since 1962 was four years (1991 to 1994; see chart). The timing of a near-term rate increase will be similarly out of step with what the bond market is telling us. 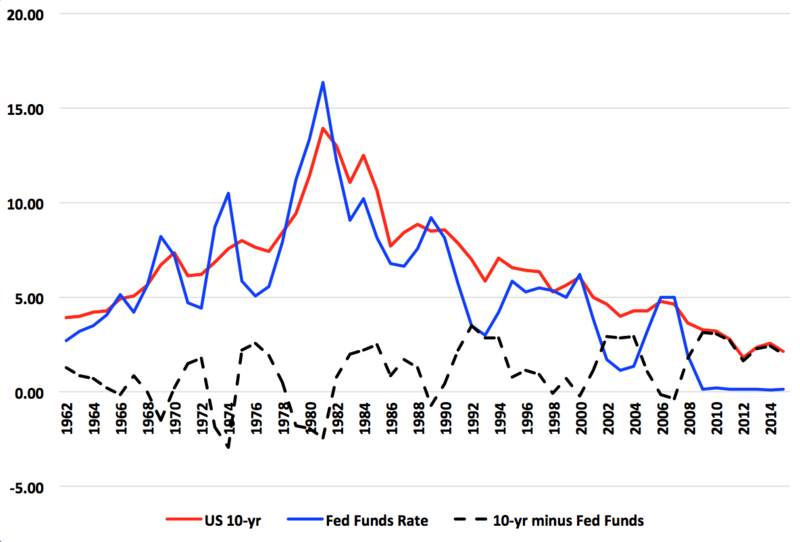 The federal funds rate is not going up meaningfully any time soon, but more importantly, neither are interest rates more broadly. That may be good news for already inflated stock market valuations, but it reflects poor domestic and global economic fundamentals: historic record high corporate profit margins, 15 years and counting of significantly below-normal GDP and gross world product growth and a continuation of global economic deceleration, slowing productivity and poor demographic trends. The decline in the official unemployment rate to 5.1% from 5.3% was entirely due to a drop in the official labor force, and a slightly larger increase in official employed than the official jobs increase (separate surveys). None of these factors speak to any signs of increased vigor in the U.S. economy. Historical data show that unemployment of 5.3% or less is generally necessary for sustained wage growth. Hourly wages ticked up in August by 2.2% vs. the same month a year ago and increased 0.32% sequentially over July. Those are the eighth and seventh best comparisons, respectively, in the last 44 months. One might characterize this reading as a hopeful sign, but labor slack says otherwise. The official unemployment rate now sits below that critical marker of labor scarcity, but household income remains at circa 1995 levels.